Canada's Hillary Janssens and Caileigh Filmer are world champions after scoring gold medals in the women's pair final at the world rowing championships in Plovdiv, Bulgaria, on Saturday. 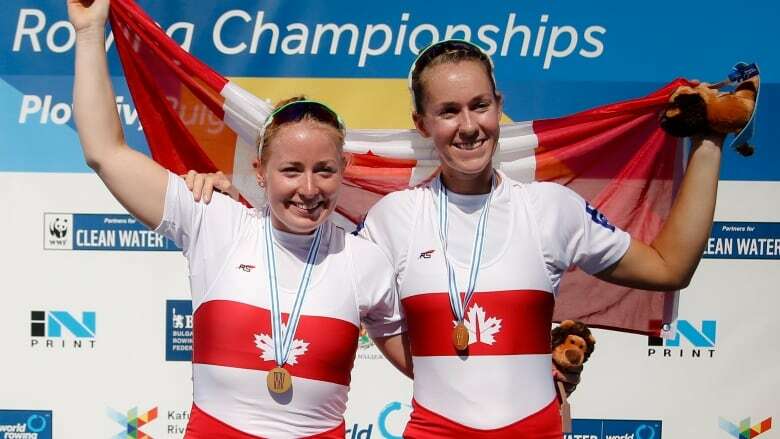 Canada's Hillary Janssens and Caileigh Filmer are world champions after scoring gold medals in the women's pair A final at the world rowing championships in Plovdiv, Bulgaria, on Saturday. They posted a time of six minutes, 50.67 seconds over the 2,000-metre race — shattering a 12-year-old Canadian record at a world event — to give their team three medals with one day left. "It is such an amazing feeling to finally achieve exactly what we had been imagining — racing against the world's best and winning," Janssens, of Cloverdale, B.C., said. "We knew it would be tight with New Zealand. We put in a lot of work improving our last 500 metres and knew we had it in us to row out in front." It was the first year together for the pair. They won gold and silver at previous World Cup events. "We are still a very young team so we will keep working hard over the winter to ensure we keep getting better and faster," Janssens said. Reigning world champions Grace Prendergast and Kerri Gowler of New Zealand finished a little more than two seconds behind the Canadians in second (6:52.96) while Anna Boada Peiro and Aina Cid of Spain were third (7:04.60). Janssens and Filmer, who hails from Victoria, also captured gold in early June at a World Cup event in Belgrade, Serbia, stopping the clock in 6:58.88 to defeat Peiro and Cid. Elsewhere on Saturday, Mackenzie Copp of London, Ont., and Taylor Perry of Ancaster, Ont., placed fourth in the men's pair. "We are happy with what we have done this week in the time we have been together," said Perry. "We had a goal of having our best piece and we both believe we executed that." Canadian para-rowers Andrew Todd, Bayleigh Hooper, Kyle Fredrickson and Victoria Nolan were fourth in the PR3 mixed coxed four final in 7:10.21, more than five seconds behind the bronze medallists from France. Canada will have a chance at more medals on Sunday in the PR1 women's single sculls (Tracy Van Asseldonk), double sculls (Gabrielle Smith and Andrea Proske) and women's eight — Lisa Roman, Stephanie Grauer, Madison Mailey, Susanne Grainger, Christine Roper, Sydney Payne, Jennifer Martins, Rebecca Zimmerman and Kristen Kit.